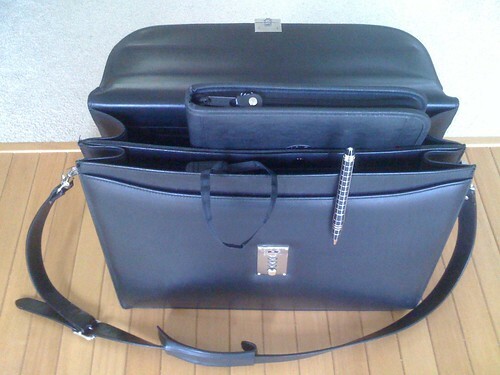 Yes, I carry a briefcase to work. It kinda makes me feel smart. (And I need all the help I can get….) It’s a T. Anthony double-gusset flap briefcase. In it, I carry a Kamehameha Schools fake-leather folio, a Montblanc Starwalker pen, a Burberry compact umbrella, my glasses, an iPhone charger, a bunch of business cards, and sugarfree gum. What’s in your bag?